The developers of AdBlock Plus, an extension for Firefox that blocks advertising on websites, are trying to contain a brewing controversy over their decision to allow some non-flashy ads to be displayed by default. On Tuesday, the Germany company Eyeo will release the 2.0 version of AdBlock Plus, which has a feature enabled by default that will not block ads that are, as company co-founder Till Faida puts it, not annoying. The feature, called "Allow non-intrusive advertising," can be turned off. "The feedback we've been getting over the years from users is 'We don't mind ads but they are too annoying," said Faida, who works with Wladimir Palant, the project lead for AdBlock Plus since 2006. "The feedback we get from webmasters is 'You're destroying our only revenue stream. We can't create content for free if our ads are blocked'," said Faida. The new feature will allow ads to be shown that are static with no animation or sound; those that are text-only without attention-grabbing images, and those that use at most one script that delays the loading of a page. "We are looking for some middle ground here," Faida said. "The only option we have is to make very clear what are acceptable ads and which are too annoying to be shown to the user." A survey of AdBlock Plus users found that while 21 percent said they never want to see any ads, the other 79 percent said advertising is acceptable as long as it's not too disruptive, Faida said. AdBlock Plus's power to block advertising revenue to webmasters has grown in the last two to three years, Faida said. At least 12 million people use AdBlock Plus each day, according to Eyeo, which obtains the data when the extension polls its servers for updates. Faida estimated the number of worldwide users at about 30 million. Some websites attribute the use of AdBlock Plus to a 50 percent to 60 percent drop in advertising revenue, Faida said. 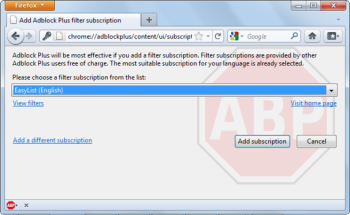 The changes to the extension were announced last week on the AdBlock Plus blog. Since then, AdBlock Plus has come under fire. Faida said they've been wrongly accused of being in some sort of agreement with advertising networks. "They are concerned that we have sold out and are collaborating with Google," Faida said. "We don't want to support large advertising networks like Google." It isn't possible for AdBlock Plus to automatically identify obnoxious ads. Instead, Faida said they've made agreement with a few mostly German websites to show ads that meet the specifications, and those ads are not blocked. If advertising networks decide to participate, AdBlock Plus will turn off blocking when companies begin serving ads that comply. One of those sites is netzwelt.de, a tech website. On that site, if "Allow non-intrusive advertising" is not turned off, it will display sponsored Google text ads that appear after a search, Faida said. On another partnering website, t3n.de, AdBlock Plus with the feature enabled allows the static images of sponsors shown on the right-hand side. Faida said Eyeo doesn't have a financial interest in the latest change. The small company is dedicated to only developing AdBlock Plus, which is free, and has been funded by a private donor who is interested in issues such as privacy and the tracking by companies of Internet users, he said. "There are a lot of conspiracy theories out there," Faida said. The new feature "was a request from a large majority."